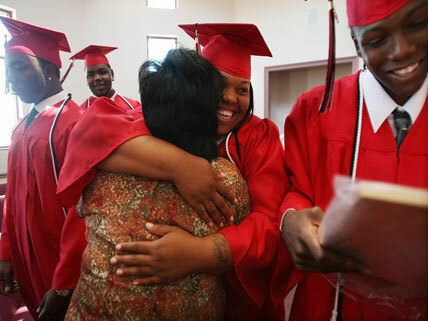 Graduates of Livingston High School celebrate after their commencement in June 2008 in New Orleans, Louisiana. Sixty years since the landmark Supreme Court decision Brown v. Board of Education, there is growing evidence that many of the nation’s schools have become resegregated, or divided by race. In the experience of more and more students, it is as if the Brown decision that said separate schools for black and white students are unequal never happened. Many school populations are now predominantly made up of students of a single racial group—whether white, African American, or Hispanic/Latino. This resegregation is not required by law, but is largely the result of court decisions that have allowed school districts to set their own policies concerning integration. The positive legacy of the Brown decision on racial equality has been deep and long-lasting, but that outcome did not come easily. The Supreme Court ruled that public school segregation, which was the law throughout the South, was unconstitutional and must be ended “with all deliberate speed.” School districts were placed under court order to integrate, with federal courts supervising local plans to do so. In the early 1970s, nine in ten African American children were attending integrated schools. Court-ordered desegregation made the South the most integrated region of the country, far more so than either the Midwest or the Northeast. Beginning in the 1980s, school districts began to be freed from court oversight, if it was deemed they had shown a “good faith” effort to eliminate segregation. Today’s intensely segregated schools—those that are 1 percent or less white—have been labeled “apartheid schools.” The number of such schools nationwide has skyrocketed from 2,762 in 1988, when school integration was at its peak, to 6,727 in 2011. The trend toward resegregation is worrisome to those who value a more integrated, equitable American society and who believe in the goal of students of all colors being educated side by side. In the 1960s and 1970s, strong support for desegregation resulted in increasing academic achievement for African American students. Resegregation may be undermining those gains. Watch a video interview with journalist Nikole Hannah-Jones, a researcher for ProPublica, about the resegregation of public schools, with a special focus on Tuscaloosa, Alabama’s Central High, which was at one time one of the nation’s integration success stories. Read the full Tuscaloosa “case study” on resegregation here. This study by Stanford University researchers focuses on the resegregation nationwide that has resulted from the lifting of judicial oversight from school districts.